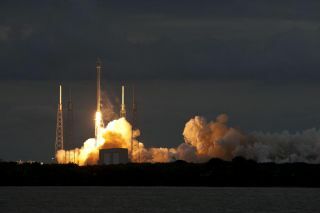 A SpaceX Falcon 9 rocket blasts off from Florida's Cape Canaveral Air Force Station on Jan. 6, 2014, carrying the THAICOM 6 telecommunications satellite to orbit. Launching for the second time in five weeks, a SpaceX Falcon 9 rocket lifted off from Cape Canaveral on Monday (Jan. 6) and successfully put a broadcasting satellite in a high-altitude orbit for a Thai communications operator. The half-hour mission came just over one month after SpaceX tallied its first launch into geostationary transfer orbit, an orbit favored by communications satellite companies seeking to deploy spacecraft in orbits over the equator synchronized with Earth's rotation. SpaceX's webcast streamed video from cameras mounted on the rocket, showing a smooth ascent into the upper atmosphere before the Falcon 9 shed its nine-engine first stage about three minutes after liftoff. The second stage's Merlin 1D engine, fitted with an expansive nozzle optimized for firing in a vacuum, ignited to propel the Thaicom 6 spacecraft into a temporary orbit. The second stage shut down its engine and coasted across the Atlantic before restarting to boost Thaicom 6 into a targeted orbit reaching as high as 90,000 kilometers, or 55,923 miles. SpaceX confirmed the launch was successful on the company's Twitter account: "Falcon 9 has successfully deployed Thaicom 6 into its target orbit." SpaceX worked over the holidays to ready the Falcon 9 launch pad after the company's successful Dec. 3 launch of the SES 8 television broadcasting satellite, marking the Falcon 9's first mission to geostationary transfer orbit. Officials delayed the launch from Friday to resolve a technical concern with the Falcon 9 rocket. Emily Shanklin, a SpaceX spokesperson, said the company did not plan to recover the first stage from Monday's launch, giving Thaicom 6 all the power it needs to soar into a high-altitude orbit stretching as high as 90,000 kilometers, or 55,923 miles, from Earth. SpaceX hopes to make the Falcon 9's first stage reusable, eventually guiding the spent rocket stages back to a rocket-assisted touchdown on a landing pad near the launch site. Engineers tested the terminal phase of a first stage's return with a testbed named Grasshopper, which completed hops as high as 2,400 feet at SpaceX's rocket development facility in McGregor, Texas. On the Falcon 9 rocket's first flight from Vandenberg Air Force Base in California on Sept. 29, SpaceX attempted to recover the first stage with a controlled soft landing in the Pacific Ocean south of the launch site. The rocket re-ignited its engines to slow its speed for splashdown, but the first stage began spinning and the leftover propellant in the fuel tanks centrifuged outward and away from lines leading to the engines, causing a premature engine shutdown. Monday's launch came about a year later than scheduled when Thaicom, a public company partially owned by the Thai government and based in the Bangkok metropolitan region, announced the launch contract for Thaicom 6 in June 2011. Thaicom said in 2011 the Thaicom 6 project was a $160 million investment for the company, including the spacecraft, launch services and insurance. Thaicom 6's operator has sold more than 66 percent of the satellite's capacity, according to a Dec. 25 press release. Thaicom 6 will be positioned in geostationary orbit at 78.5 degrees east longitude, reaching customers across the Asia-Pacific and parts of Africa. The satellite, built by Orbital Sciences Corp., will provide the broadcast industry with improved television quality and additional high-definition channels, according to Thaicom. It carries 18 C-band and eight Ku-band transponders connected to three antennas. In May, Thaicom announced it acquired an unidentified satellite already in orbit to provide interim communications capacity from the 78.5 degrees east position while waiting for the launch of Thaicom 6. Fearing Thaicom 6 would not be launched to meet regulatory deadlines, Thaicom said the newly-acquired in-orbit satellite would ensure digital terrestrial television stations waiting to use Thaicom 6 complied with "must-carry" regulations requiring broadcasting by a certain date. Jonathan McDowell, an astrophysicist at Harvard-Smithsonian Center for Astrophysics who tracks global satellite and launch activity, said the AsiaSat 7 satellite was the only candidate for the acquisition by Thaicom. It maneuvered into position last summer at 78.6 degrees east longitude, based on publicly available orbital tracking data, McDowell said. The launch of SES 8 required an in-flight restart of the Falcon 9's upper stage Merlin 1D engine, a tricky endeavor which failed on a test flight of SpaceX's upgraded Falcon 9 rocket in September. SpaceX's Falcon 9 rocket launched the Thaicom 6 communications satellite from Cape Canaveral, Fla., on Jan. 6, 2014. The launch of Thaicom 6 largely duplicated the Dec. 3 flight, sending the 3.6-ton satellite to an orbit stretching more than 50,000 miles from Earth at its highest point. The mission took about a half-hour from launch to spacecraft separation. It marked the eighth flight of a Falcon 9 rocket since 2010, and the third launch of the launcher's newest version since its debut in September in a flight from Vandenberg Air Force Base in California. The upgraded Falcon 9, known as the Falcon 9 v1.1, uses upgraded Merlin 1D engines configured in a circular arrangement dubbed the "octaweb" and employs larger propellant tanks and more redundant avionics systems. It also features a simplified stage separation system, using three attachment points instead of 12, according to SpaceX founder and CEO Elon Musk. Monday's launch opened a busy calendar of missions planned by SpaceX in 2014. — SpaceX will launch up to three resupply missions from Florida to the International Space Station using the company's Dragon cargo spacecraft. The flights would mark the third, fourth and fifth operational logistics launches under a 12-flight, $1.6 billion contract with NASA. — Two Falcon 9 launches are planned from Cape Canaveral with a total of 17 small second-generation data relay satellites for Orbcomm. — A pair of Falcon 9 rockets will launch from Cape Canaveral with the AsiaSat 6 and AsiaSat 8 communications satellites for AsiaSat of Hong Kong. — Turkmenistan's first satellite, Turkmensat 1, will launch from Florida in late 2014 on a Falcon 9 rocket. The satellite is part of Turkmenistan's National System of Satellite Communications and was originally contracted to launch on a Chinese Long March rocket before SpaceX scored the launch in June 2013. — The first test flight of SpaceX's Falcon Heavy rocket is scheduled to launch in 2014 from Vandenberg Air Force Base in California. The Falcon Heavy is powered by 28 engines, with 27 of the Merlin powerplants designed to ignite on the launch pad. SpaceX says it can loft up to 53,000 kilograms, or nearly 117,000 pounds, to low Earth orbit. — Two critical tests for SpaceX's efforts to develop a crewed version of the Dragon spacecraft are on tap for 2014. One of the tests will simulate an aborted liftoff from the launch pad, with the Dragon's pusher escape thrusters taking the capsule away from a failing launch vehicle. Another demonstration, currently set for mid-2014, will test the Dragon's ability to escape its booster at the point of maximum aerodynamic stress about a minute after launching on a Falcon 9 rocket. ­— The SAOCOM 1A radar observation satellite is scheduled to launch in late 2014 or early 2015 on a Falcon 9 rocket from California.